Shady areas are a challenge for a gardener: special plants have to be chosen that will thrive in this microclimate of your landscape, look good, and will be easy to maintain. What works in one region where it might be cloudy and damp, might not perform well in a shaded Mediterranean garden. Always consult local botanical gardens, nurseries, and master gardeners for tips and plant recommendations. Continuity and Consistency: Yes, full-sun and light-shade plants differ. But aim to use the same or similar plants throughout the yard to tie it together, so it doesn’t seem like you accidentally wandered into someone else’s yard. Choose plants that grow in partial sun/shade to transition from one zone to another. Containers: Plants potted in attractive containers can be easily moved throughout the garden, according to light needs and season. 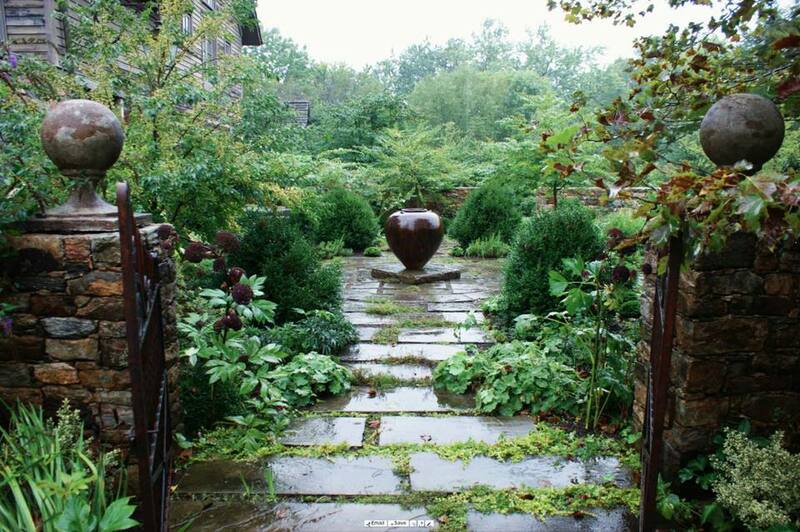 Hardscape: Break up a potentially gloomy spot with rocks, boulders, a path, arbor, or other hardscape elements. Water: Consider building or installing a fountain or other water feature to reflect light, create movement, and add sound to an otherwise quiet dark space. Lighting: Subtle lighting that will illuminate the shady area in the late afternoon will draw attention to the space, highlight plant forms, and make the area more usable​. A roof terrace in the London neighborhood of Notting Hill (yes, that Notting Hill) is undeniably charming but limited on space. With that in mind, look for vertical space–on walls, trees, and basically anything that can climb upward. Adolfo Harrison Gardens of London designed a private, modern space with hardwood decking, mature grapevines pruned and trained into trees, and other shade/sun-tolerant plants. Although Harrison says the area is in the sun, it is London, which sees its share of rainy and overcast days. Bliss Garden Design created a lush space with many shades of green and various textures for this Bainbridge Island property in Washington. Some of the species used include Acorus gramineus 'Ogon,' Brunnera macrophylla 'Jack Frost' and Polystichum polyblepharum. 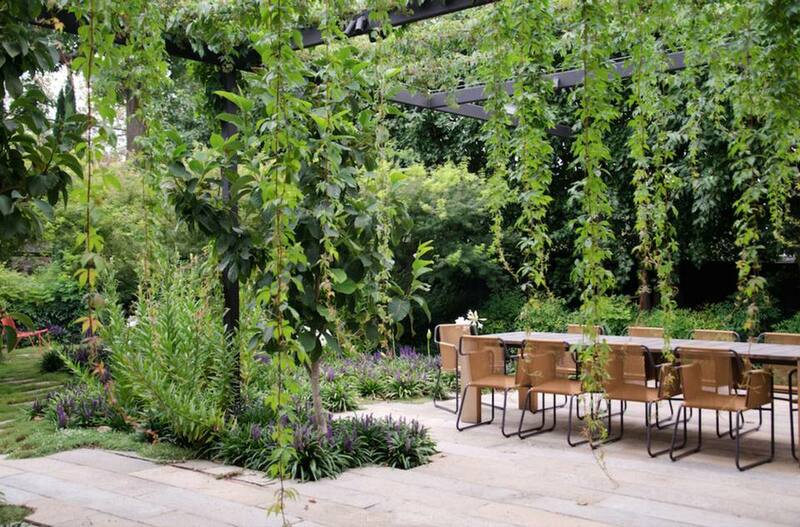 In lieu of outdoor drapes for privacy, Eckersley Garden Architecture planted a curtain of Virginia creeper to create a shady and secluded outdoor dining room for a home in Toorak, which is a suburb of Melbourne, Victoria, Australia. The garden is sunny in winter and shady in summer and has lots of deciduous planting. Space is at a premium in densely populated Southern California, so you might want to reconsider outdoor areas like side yards if your property is limited. Debora Carl Landscape Design transformed a neglected side yard into a charming gravel getaway at this lovely home in Cardiff-by-the-Sea, near San Diego. A vessel fountain creates a focal point, movement, and sound in the space. White impatiens brighten up the spot, along with the purple spikes of Liriope muscari 'Big Blue'. That drought-tolerant, shade-loving vine is creeping fig (Ficus pumila), which likes to attach itself to fences and walls. A property in San Diego County with lots of outdoor space flows beautifully from front to back with winding granite pathways. Designed by Torrey Pines Landscape, this shady spot gets pops of color from flowering hydrangea, Breynia nivosa, Trachelospermum jasmine, Liriope giganta, Begonia richmondensis, all accented by Cassia leptophlly trees. Yes, a garden can be in semi-shade but still be hot. A deep and narrow garden in Santa Fe, New Mexico became an irresistible outdoor room. Mark Design transformed it in just four months. Since it gets hot in the summer, Mark hung a 14 x 14-foot shade sail canopy over a raised flagstone patio to make dining and relaxing more comfortable. Taking advantage of vertical space, he installed a hanging succulent planter on the red-orange wall. Obviously, succulents are drought tolerant and are fine in shade, especially during the summer. That lush-looking lawn is actually artificial turf. To cool things off, Mark constructed a stone fountain with water that pools at the top and rolls down the boulder. Plants used in borders and beds include coral bells, columbine, Japanese maple, and a blue spruce pine tree. That's an English ivy scaling the walls. During their world travels, the homeowners of this property in Santa Barbara, California collected an assortment of garden ornaments and objects which they hoped could be incorporated into a new landscape design. One of the biggest challenges for Grace Design Associates in creating this Asian garden was proportion and scale: artistically using various-sized statuary and hardscape elements in a 40 x 80-foot outdoor space. The objects the design firm worked with include a 6-foot-high Buddha, a 1,500-pound stone urn, and a prayer bell. Trees and plants were chosen and carefully placed to provide balance and counterweight to the ornaments and statues in the garden. Shade-tolerant plants include Korean grass, papyrus, and Japanese maples. Starting with a blank slate, Karena Batstone created a series of garden rooms for this property in Norfolk, England. Assisted by Tom Stuart Smith, Batstone added walkways, an ironwork ambulatory, a sunken pond surrounded by yew hedges, wildflowers, and more. Mature trees and English overcast days create a need for shade-tolerant plants. A large estate in Greenville, South Carolina has many mature trees that create much-needed shade during the hot summer months. For this shady side terrace, The Collins Group used stone pavers planted with vivid green Mazus. Other plants include mondo grass and autumn ferns. The blue and green chairs bring bright colors to the space. An 1840s-built Greek Revival brownstone in New York is modern on the inside, with artwork from Dali, Gaudi, Armani, and Versace. Axis Mundi Design continued that modern vibe to the semi-shady outdoor terrace. Although it's paved in old-world Belgian cobblestones, the surface looks contemporary with a teak fence and electric orange and red Paola Lenti (Karkula) chairs. Hydrangeas are among the shade-tolerant trees and shrubs. Also on the design team: John Beckmann and Richard Rosenbloom. A peaceful yard with a clear blue pool in Devon, Pennsylvania is surrounded by established tall and wide trees that create canopies of shade. Designed by Texada Landscaping, the formal design includes hostas and ferns. A winding, edged gravel path travels through the yard of this home in Charlotte, North Carolina. Designed by W. J'Nell Bryson Landscape Architect, shady borders and beds include lettuces, which prefer less sun in the summer.